Beer is profit. In fact, in many restaurants and foodservice operations, the bar and beverage program is the most profitable aspect of the entire business. But what does this have to do with clean glasses? It all comes down to foam, waste, and the quality of beer. 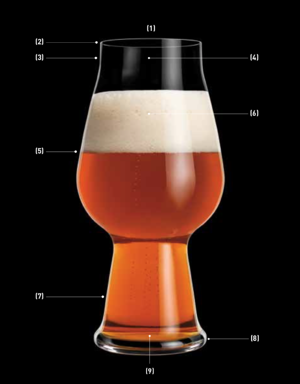 When a beer glass is clean, it allows a beer to open up a true head that brings out the flavors and aromas of the beer. This creates a higher quality beverage, making each pour more consistent and making each guest happier. A proper head is critical to the ideal beer making experience. This isn't the whole story, though. A clean beer glass also requires less beer per pour in order to achieve that head. For example, if a pint glass is clean, only 13-14 ounces of beer is required to create a proper head. When the glass is dirty, though, it might take as much as 15 ounces of beer to fill the glass. The bottom line is a clean beer glass requires less beer to fill it, and it leaves customers happier about their experience. But how do you achieve a clean beer glass? You have to start by eliminating the things that can make them dirty in the first place. These are items such as oils, lipstick, and food particles, and the right detergent can help eliminate these unwanted agents as efficiently as possible. This one-of-a-kind detergent is specifically designed for beer and bar glasses. Its main purpose is to eliminate these unwanted items on glasses, allowing for full head retention, ideal flavor profiles, and the perfect pour without any streaks or spots. 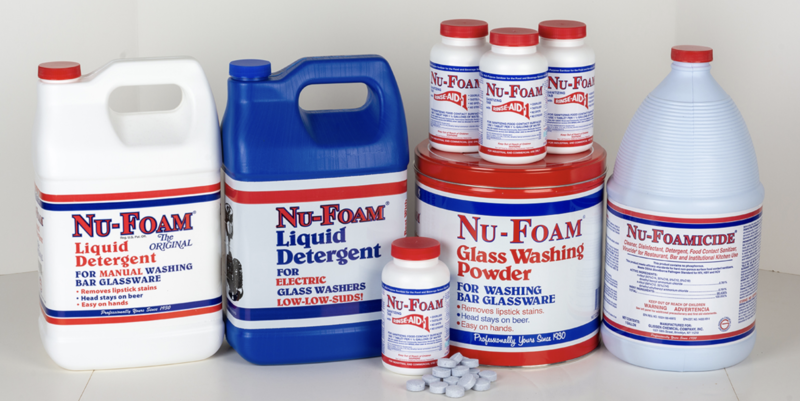 Nu-Foam comes in both liquid or powder form, and it's ideal for use in bars, taverns, pubs, and restaurants where the quality of the beer or beverage is important. It also cleans glasses to the point where they sparkle like crystal. As you probably know, certain beers achieve their full potential in certain types of glassware. IPAs and stouts, for example, can achieve their full potential with a full globe topped by a narrow chimney. This funnels the aromas right into the customer's nose, further enhancing the flavor. Pilsner, on the other hand, reaches it potential in tall, narrower glasses. (1) Suitable diameter of the rim to reduce the speed in which the beer is delivered into the mouth giving sufficient time to the taste buds to recognize the taste elements appropriately. (2) Laser-cut fine rim: 1.2 mm thickness avoids turbulence and guarantees a pleasant mouthfeel. (3) Chimney to balance the aromas. (5) Bowl shape incurved specifically for each Style of Beer to capture the right aromas. (6) Foam (Head): “aromatic conveyer” avoids the oxidation of beer without altering the level of bitterness. (7) Narrow stem: easy and pleasant to hold and it reduces heat transfer from hand to beer. (9) Foam Control System: Laser etched circle helps maintain a fine and persistent stream of bubbles replenishing the head and releasing the aromas at the same time. The right glassware should bring out the colors, flavors, and aromas of the beverages they contain. The right glassware should be strong, sturdy, and durable in order to hold up to day-to-day usage. The right glassware should be elegant and enhance the consumption experience. The right glassware should be clean. The right glassware can be found right here.